Melanoma of the foot at an advanced stage. This is a relatively rare tumor, making up less than 1% of eyelid cancers. It typically appears as a pigmented thickening of the eyelid or extension of pigment from the conjunctiva. 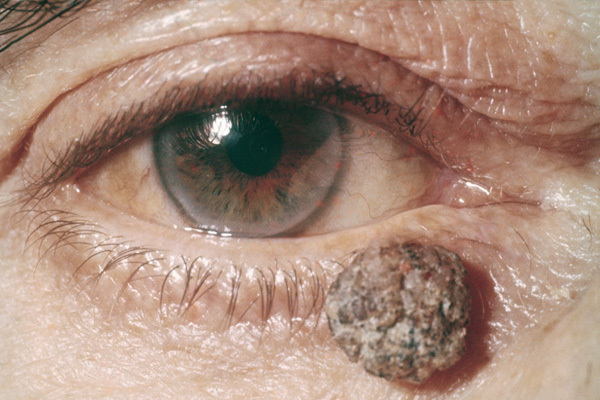 Ocular melanoma may be more common in people who have atypical mole syndrome. This is an image of melanoma in the loin. The loin is in close proximity to the back, and melanoma of the back is the most common form of melanoma in men. This image is of a dark, pigmented malignant melanoma of the arm. Light micrograph of melanoma skin cells with melanoblasts. Melanoma can develop even in areas that receive little sun exposure, such as the feet and ankles. The three most common areas for foot melanoma are the soles, between the toes, and around or under the toenails. Melanoma of the foot or ankle often goes unnoticed during its earliest stage and is frequently diagnosed at an advanced stage, which goes along with a higher mortality rate. Approximately 10% to 20% of all cutaneous melanomas arise in the head and neck region. Melanoma of the neck accounts for 29% of cancers in the head and neck region, and melanoma of the scalp makes up 14% of cancers in that area. Melanoma is the most dangerous type of skin cancer, and the most deadly. It begins in the melanocytes, but may also begin in a mole or in other pigmented tissues, such as the eye. It is estimated that there will be 76,250 new cases of melanoma in the U.S. this year. The number of deaths is estimated to be 9,180. 1) Superficial spreading melanoma: usually flat and irregular in shape and color, with different shades of black and brown. Found most commonly in Caucasians. 2) Nodular melanoma: starts as a raised area and is usually dark blackish-blue or bluish-red. 3) Lentigo maligna melanoma: sun-damaged skin that appears large, flat, and tan with areas of brown coloring. Found most commonly in the elderly on the face, neck, and arms. 4) Acral lentiginous melanoma: usually occurs on the palms, soles, or under the nails and is more common in African Americans.